HOLY SMOKES!!!!!!! I had a gut feeling this was coming soon! 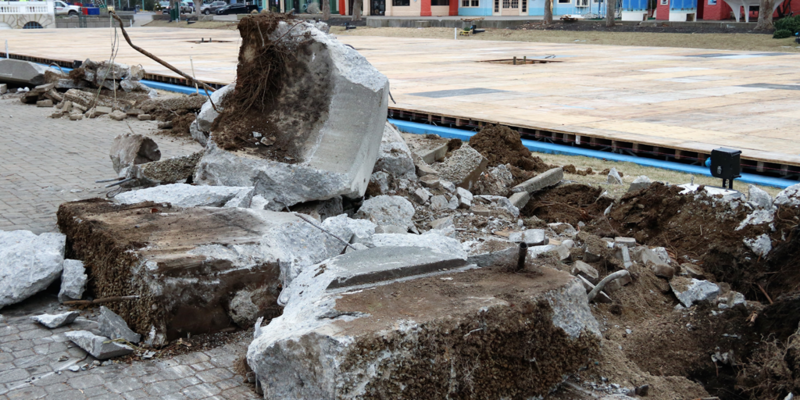 No element of International Street will be left untouched as crews update the Royal Fountain, install more than 130,000 new pavers, improve each building façade and enhance the landscaping. Sounds pretty wonderful. I hope to see some additional “international” additions in the coming years! Very excited for this! I'm excited too! I believe the addition of "international" themes will not only benefit the park, but the guests as well. This is great! Hopefully the ambient music will go along with all of these wonderful updates. Wow! Never saw this coming! Between this and the return of the Antique Cars, this will be quite the memorable season! Ah, I remember walking in to a glorious fanfare and seeing International Street. It added to the magical experience, one I hope I can reciprocate for my daughter when she's old enough. This is awesome news! This is actually the best improvement they could make at the park IMO. Kings Island's International Street has been way outdated and not-so-nice for a while. Lack of shade. The hideous white picnic tables. Tables right up against the walkways. King's Dominion's International Street is so much nicer that present KI. Kings Dominion has lots of wonderful trees and lush landscaping. There is shade EVERYWHERE. There are nice umbrella tables by the fountain to sit, and they are separated from the walkways with landscape islands. Let's hope that King's Islands ends up like this as well. Lets hope the plant more TREES! King's Dominion International Street at Winterfest also blew way the Kings Island version. It was much more immersive with the lights in the trees all above you wherever you were walking. Although King's Island's Snowflake lake was better because it was lower in the ground and more visible. It looks like they are taking the ugly pedestal fountains out. Kings Dominion and Canada's Wonderland's fountains come directly out of the water, which is a much sleeker look. Hopefully that is the case as well. I am soooo happy Cedar Fair bought these parks. In the begin, I thought they would become generic parks because of the way Cedar Fair didn't care much about atmosphere or theming in the past. But they are returning the Taft parks to their former glory after the destruction that Paramount did. This has me really excited! I-street is the first impression a guest has when walking through the gates. I already thought it looked good but there is always room for improvement. On my personal bucket list of improvements that I hoped would come to KI was new fountains with choreographed shows. I thought that at the end of the day the fountains could also be choreographed with the fireworks. Very excited for this! I'm very excited to see IS brought back to its former glory. Hopefully they don't take out all the trees in the process but I look forward to seeing what is in store. Please keep the pedestals! It's very ironic that this was released today. Last night I was looking at YouTube videos of Canada's Wonderland IS and I thought to myself how much nicer the KI Royal Fountain looks. The best thing is I would assume the parks are biggest part of Cedar Fair income so they actually care about them. During the Paramount days it was hardly a drop in the bucket income wise for CBS. I think the fountain change will help immensely during winterfest. Larger ice rink without fountains in the middle of it. True. And Bellagio style shows in the fountain will be fantastic! Also.... does this new makeover include a new entry gate? Are they going to update the International restaurant too? Are they cutting out the trees? (I hope not). Perhaps they are adding additional shops and restaurants too or are they only updating facades.... hmmmm can’t wait to see the results. This is so great to hear!! I was discussing a makeover of international street not too long ago in another topic. I cannot wait to see the outcome! Keep the fountains and pedestals, its an iconic look for KI when you walk into the park. Not every park should be the same. I like the way the Royal Fountain is better then what KD or CW has, they all look great in their own way though! For starters, looks like the fencing around the fountain is being replaced with a masonry wall, which would fit in with the claim that guests will be able to get closer to the fountain than before. Of course, how long before someone(s), decide to jump what looks to be a low fence and into the fountains? I don’t want them to get rid of the pedestals. There’s still plenty of room to skate around them especially now that they took out 2 of them during Winterfest. Found some pics in our gallery of early IS fountains and path. I wonder how close it will be to this for 2019? It was mentioned that the International Street Bandstand would also be expanded. This is both an upgrade and a logistical piece. It’s a not-so-kept secret that the Bandstand is simply the roof of the pump house for the fountains. The current fountain setup consists of sand filters, which are an old technology. These are very large - about the size of a Smart Car and a half. These will likely be replaced with cartridge filters that will both increase the fountain’s turbidity and be able to handle the PSI associated with the new fountain technology. These are much smaller. To remove the old sand filters would be an interesting feat. 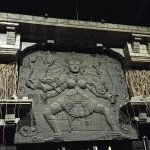 You could cut them up, or (more likely) destroy the stage and remove them vertically. 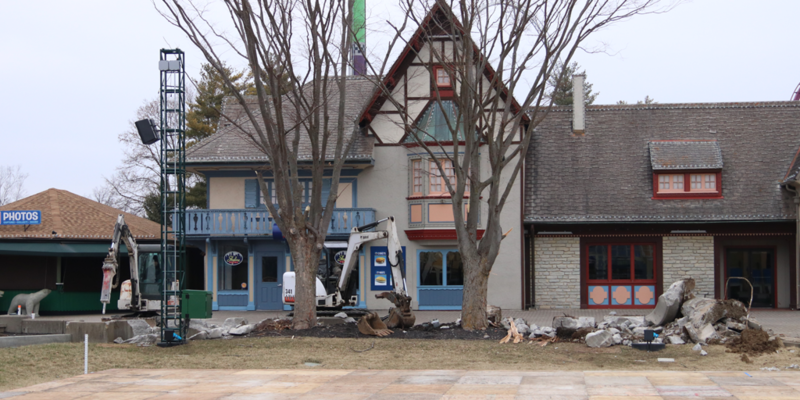 So the fact that the Bandstand is being redone and the fountains are being redone at the same time. I am familiar with the “show fountain” technology that is typically used, but do not know the specifics of what they are doing. Kings Dominion has a pump house the size of Kings Island’s current one, but their fountain lacks the inherent complexity of KI’s. I have a feeling that more space is needed. The cool part about this is that, if they do essentially raze the Bandstand then they have a fantastic opportunity to start from scratch and build it in a manner that meets the needs of 2019 and beyond. Don’t forget that for the core season, Peanuts Celebration, and Winterfest, they extended the stage with large risers, which may not be necessary moving forward. Sweet--Just don't touch the Don Quixote statue! I hope the "street" is put back into International Street. I like that in the photos above, there is a distinction between the "street" and the "sidewalk". For accessibility reasons, the sidewalks don't need to be raised curbs, they could just be a different style of pavers. I also like having tables with umbrellas along the buildings rather than along the fountain. I think it adds to the street-like atmosphere. I wonder if the widening of the pathways has something to do with the new parade next year? Also, I hope the horrible pastel paint colors will be a thing of the past. I love this, but I must say I'm on team keep the fountains. I have to agree, I’m quite excited about the upgrades being made but also hope they keep the pedestals. I also hope they don’t have to paint the floor of the fountain a dark color like they’ve had to do with KD and CW in order to hide the mechanics. I really hope you’re right too. What I’m thinking is that based on the fact that the pedestals are clearly being painted in the photos they’re here to stay. 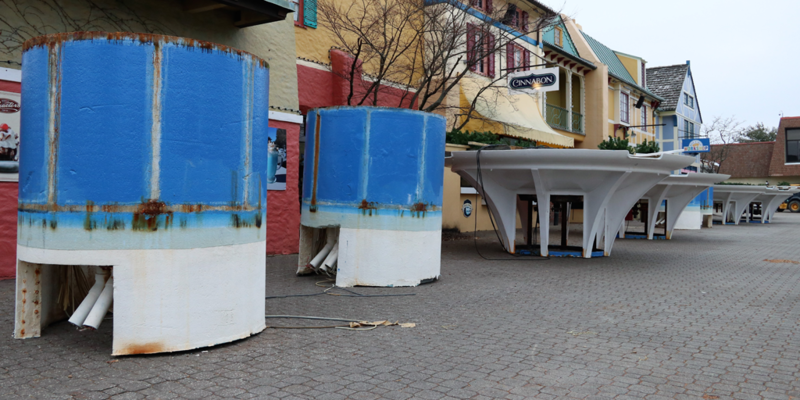 Wonder if they will put back the two pedestals taken out for Winterfest back in place to restore to the original 6 pedestals or will they only put back the four shown in the picture (thereby making future Winterfest conversions a bit easier). The "Pedestals" you see today were altered for either the 2nd or 3rd season of operation. Originally, the water bowls sat on top of the simple round cylindrical "tubes." Later, for decoration (and added support) the bowls were given 8 support arms each. In the pictures above you can see how the original pedestal "tubes" still exist and the original bowls with the later-added arms sit over top of them. The original IS configuration's street-scapes, curbs etc were all removed/altered for the first Winterfest in 1982. That's also when the "trees" were added along the fountains. The pavers on IS are the oldest in the park - and were added many seasons (1982) before other areas in KI - they have been repaired/replaced a few times over the years. The fountain and its filtration system was completely overhauled in 2003 due to a severe series of "cracks" that left the original concrete crumbling and leaking underground in places. Basically, they built a fountain over the fountain. This was also done in prep for the return of the 2005 Winterfest. For 2005's Winterfest, additional pathways from IS down to the fountain were added for access to the ice-rink. There is a long-standing rumor that a capsule of personal momentos may have been placed under IS by the original designers/contractors. But I've never had it verified officially. Which picture shows the pedestals being painted? They look like rusted crap to me.